Differing outcomes for historic homes - The Resident Community News Group, Inc. | The Resident Community News Group, Inc.
A 90-year-old Frame Vernacular style home on Algonquin Avenue in the Ortega Historic District was not able to meet at least four of seven criteria necessary for local landmark designation and thus save it from demolition. 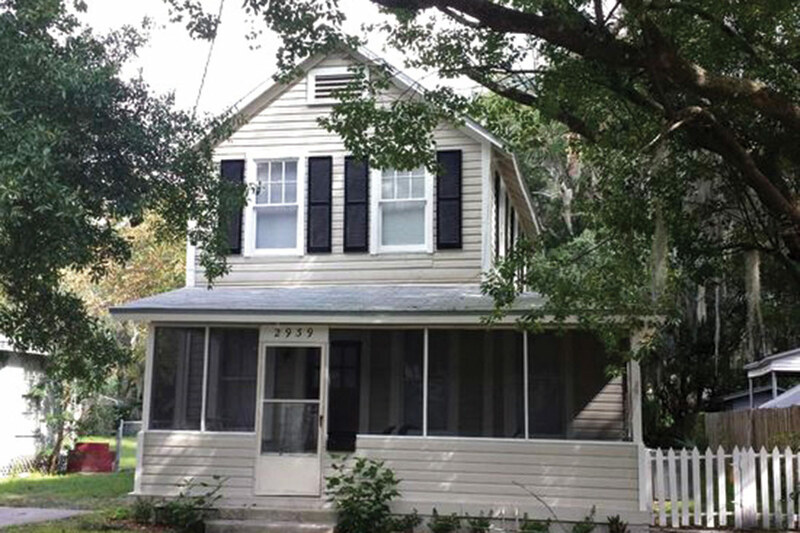 Although the City of Jacksonville Planning and Development Department found the two-story house at 2939 Algonquin Ave. met the first criteria – value as a significant reminder of the cultural, historical, architectural, or archaeological heritage of the City, state or nation – and the last – suitability for preservation or restoration – those findings were not sufficient to recommend landmark status. Additionally, owners Charlie Sandusky, a building contractor, and Paul Stewart argued the property was not able to be renovated or restored. After purchasing the property June 2017 for $142,500, they discovered extensive termite damage, wood rot and fire damage, and requested the building be approved for demolition. In a letter to the Jacksonville Historic Preservation Commission, Stewart stated he intended to build a two-story Craftsman-style home on the lot. While Property Appraiser records indicate the home was constructed circa 1926, the Planning Department staff report indicated the structure could have been constructed earlier than 1926 as reflected in its Frame Vernacular style with the steep pitched roof, drop siding, first floor wrap around porch (now partially enclosed), raised foundation on brick piers, and open rafters (now enclosed with a fascia board). The Jacksonville Historic Preservation Commission approved demolition of the property at its July 26 meeting. At the same meeting, the JHPC denied a request to demolish a home at 3723 Park St., built circa 1923, because the proposed demolition was not considered to be consistent with guidelines from the Secretary of the Interior’s Standards for Rehabilitation, the Historic Preservation Guidelines for the Riverside-Avondale Historic District, and Chapter 307 of the City of Jacksonville Ordinance Code. The property was deemed a contributing structure, with demolition considered a last resort. The staff report indicated relocation, rehabilitation, mothballing or reuse of the structure. “Mothballing” is a process which would stop the assessment of code fines while allowing the property owner time to investigate other preservation options. The owner, Sigifredo Vivas of Orlando, applied for the demolition permit to clear the land for future sale. At one point, Vivas was offered $180,000 for the property and an adjacent one for construction of a new single family home, but the prospective buyer withdrew the offer upon learning of the denial for demolition. Vivas purchased the property in 1983 for $32,500 and apparently used the single-story house as rental property. In an email to the JHPC, Vivas indicated he had received a bid of more than $110,000 to repair and renovate the 1,062-square-foot structure. The market value of the land and the structure are estimated at $159,317, according to Property Appraiser records. The property is about one-tenth of a mile from a similar structure at 1423 Rensselaer Ave. whose owner also lost an appeal for demolition two months earlier.